In order to describe the evolution of cosmic microwave background anisotropies we need to apply the relativistic kinetic and perturbation theories. Kinetic theory is necessary to describe the property of CMB photons in the metric perturbed by gravitationally unstable density fluctuations, where such fluctuations evolve according to the relativistic perturbation theory. These two phenomena combined are responsible for anisotropy formation in any model where structure formation proceeds by gravitational instability. where γi are the direction cosines of the photon momentum p (hereafter we will use for direction cosines both notations of ) and C[f] stands for the collisional term which will be discussed in the following. For the moment we restrict our analysis to a vanishing collisional term. In order to simplify the previous equation let us recall that Pi ≡ dxi/dλ and P0 ≡ dt/dλ and hence dxi/dt = Pi/P0. Note that according to such notation, it corresponds to the longitudinal gauge (or conformal Newtonian) and that to recover the results presented in previous trasparencies one should simply substitute the present paramaters Ψ,Φ with -Φ,Ψ. This to account for the different signature and notation. The first two terms account for the free streaming whereas the last two for the effect of gravity. i) Scattering couples the photons to the baryons and forces perturbations in their number and hence energy density to evolve together. ii) Scattering leads to isotropic photon distribution in the electron rest frame, hence coupling the local CMB dipole to the electron velocity. iii) In the Thomson limit, there is no energy transfer in the scattering. iv) Through Compton scattering the number of photons is preserved. From previous considerations we can state that scattering rules the intrinsic temperature perturbations at last scattering, and the bulk velocity perturbation. Since through scattering there is no change in the net energy or photon number in the CMB to lowest order, the distortions to the black body spectrum cannot arise in linear theory. Unless the electrons are heated sensibly above the CMB temperature or energy is dumped into the CMB from an external source. A further effect must be considered and concerns with the fact that photons propagate in a space-time distorted by density fluctuations, hence one must employ the geodesic equation in presence of perturbations. This generates fluctuations on CMB spectrum via the gravitational redshift effects from the dp/dt term in the previous equation. On the othe hand, The dΥi/dt term, related to the gravitational lensing, gives contribution up to the first order in a curved universe only. Note that Compton scattering tends to produce a very simple photon distribution, just characterized by a not vanishing monopole and dipole (if and only if electrons carry a bulk velocity) term. 1) Gravitational redshifts due to metric fluctuations. 2) Hot and cold spots from the intrinsic temperature at last scattering. where the “dot” simply denotes the derivative with respect to the conformal time η. Since perturbations in CMB remain small in all cosmic epoch, the Fourier transform is very useful and implies the almost independence in the evolution of each single mode. By following the approach outlined in the previous trasparencies we can deduce the form of the evolution equation for each specie present in the universe. In particular, in the case of cold dark matter it results much easier to obtain the equation from the energy-momentum conservation. Of couse what makes CDM different from photons is that by definition DM particles do not interact with any other component of the primordial fluid, and they are nonrelativistic. The two equation are sufficient to describe the evolution of the density and velocity of CDM. Note that the above equation was obtained under the hypothesis of ne=np=nb. However it results valid also in presence of neutral hydrogen and helium due to their tight coupling with electrons. It is fundamental to summarize an out of equilibrium phenomenon just driving the decoupling of photons from matter and hence affecting the pattern of CMB anysotropies observed today. * Since at early times the main contribution to Hubble parameter came from radiation and matter one has which once substituted in the r.h.s. of equation (*) provides the way to get the decoupling redshift zdecouplig . Numerical solutions of the Boltzmann equation show that decoupling just occurs during recombination. General Relativity states that particles move in a space-time perturbed by the fluctuations of the matter density. In particular the stress-energy tensor of the total matter is covariantly conserved in the perturbed metric, , whereas the matter fluctuations are the source of metric perturbations via a generalized Poisson equation. Note that the equation for ν=0 provides the number or energy density conservation (continuity equation), whilst the spatial components give momentum conservation. Unfortunately, such simple principles must face a delicate subtlety due to gauge freedom that in general affects a relativistic perturbation theory. In other words, in order to define a perturbation we must specify the relation between the physical spacetime and the hypothetical unperturbed background. Hence we denote as a perturbation the difference between quantities at the same coordinate values. Since this choice is not unique, one has to fix a gauge before making any calculations. In practice, a gauge choice means fixing the constant-time hypersurfaces and the spatial grid on these surfaces. There are two basic approaches to fixing a gauge or coordinate system. It is possible to fix a set of preferred observers and place the coordinate frame to be their rest frame. For example, the common synchronous gauge is just one example of this approach. In this case one chooses freely falling observers to define the frame, namely the collisionless cold dark matter. In such a rest frame the evolution equations result largerly simplified. The total matter gauge represents an extension of this idea. In this case, the coordinate system coincides with the rest frame of the combined relativistic and non-relativistic matter. Such a choice is very useful in the early universe where radiation dominates and does not necessarily follow the perturbations induced by the non-relativistic matter. Since we have devoted a set of trasparencies to such issue, we will simply report here the form of Einstein equation for the potentials Φ, Ψ defining the metric perturbation in the longitudinal gauge. Neglecting the small contributions coming from photons and neutrino quadrupoles one would get from the previous expression Φ = – Ψ . Such equations have to be added to the set of differential equations written for overdensities and bulk velocities of all particle species present at the time of recombination. We here collect all equations derived for photons, dark matter, baryons, massless neutrino and metric scalar perturbations. Remind that for seek of simplicity we have neglected the angular dependence of Compton scattering and polarization of photons that would have added a further equation. plays the same role for neutrinos as for photons. and analogously for , with the Legendre polynomial of order . In the following we will abandon the notation of using a “tilde” to denote the Fourier transform since all quantities will be evaluated in the momentum space. where ε is a slow roll parameter already defined. 2) Intermediate times – walengths fall inside horizon and the universe passes from RD to MD (at a=aeq). Large scale modes that enters the horizon after aeq evolve very differently from small scale modes entering before aeq. 3) Finally all modes evolve identically again. where the background density matter ρm=Ωm ρcr /a3 and (4 π G) ρcr = (3/2) H02. with δH denoting the scalar amplitude at horizon crossing. Generally one prefers to use a dimensionless variable after the integration of the different directions The difference between cosmological models can be easily appreciated by comparing for example sCDM (flat universe + CDM) with ΛCDM (flat universe, with CDM and a comological constant). In the first case the aeq results to be anticipated by the larger amount of matter present. This means that only smaller scales enter the horizon during RD phase that is the phase depressing the inhomogeneities. For this reason the turning point of sCDM is moved on smaller scales with respect to ΛCDM (Figure 7.4 of S. Dodelson’s book). The evolution of matter overdensities does not need the solution of the complete set of equations, but just a simplified subset of them. In first approximation one can neglect baryons with respect to DM (their abundance are smaller) and quadrupole terms, hence handling with a single gravitational potential only (Φ = - Ψ). Concerning the photons at early times (before recombination a < a*) they are tightly connected with electrons/protons, hence only Θ0 and Θ1 are involved in the equations, being the higher momenta suppressed. After a* this is not true anymore, but then the behaviour of photons becomes irrelevant for the evolution of matter overdensity. Unfortunately an analytic solution of the complete set of equations is generally not available, whereas one can get fair approximation of the solution in very particular conditions. On the other hand, it is always possible to solve numerically the set of equation. In the following we will try to sketch the general behaviour of the solutions by considering two limiting conditions only (large and small scales), where analytical considerations are possible. On very large scales, one can obtain analytic solutions for the potential through the matter-radiation transition and horizon crossing sequently. Such constant is however fixed to be vanishing due to the initial conditions, hence . that together with Eq. (*) is the system to solve. Note that for small y (radiation dominated universe) , whereas for large y (a matter dominated universe) . This can be summarized stating that at large scales the potential drops of a factor 9/10 as the universe passes the equality epoch. Similar considerations on the whole set of differential equations lead to prove that potential remains constant as the mode crosses the horizon. Potentials remain constant as long as the universe is MD. 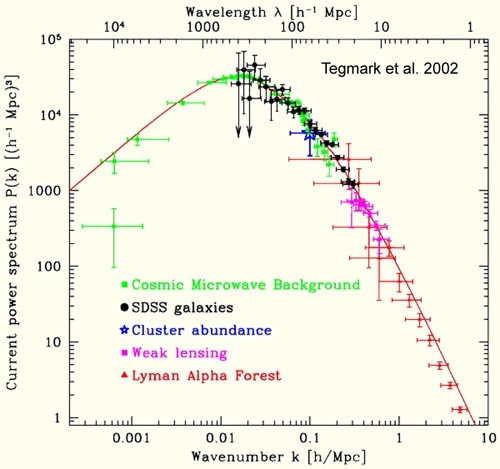 If at later times the universe becomes dominated by other forms of energy, like dark energy for a > 1/10 for example, in this case the potential decays but this affects the growth function only and not the transfer function. ii) sub-horizon modes evolving during equality epoch. The previous equation admits a single solution not diverging for η→0 that is with Φp denoting the primordial value of Φ. From this expression one can see that as a mode enters the horizon in a RD epoch its potential start decaying. After such decay it oscillates. Since we have obtained the expression for the gravitational potential, it is possible to derive the evolution of matter perturbation. Again we turn a set of two first order differential equation for δ and v, in a single second order differetial equation for δ only, namely One can see (S. Dodelson’s book) that after the mode has entered the horizon with A and B two integration constants. One can summarize the results stating that the matter perturbations grow even during RD epoch even though in a less prominent way than during MD epoch. The previous equation is valid within the horizon but before equality, namely yH << y << 1.
yH << ym << 1.
and comparing it with the previously determined expression one get explicitely the form of T.
The primordial perturbations, determined during inflation, show themselves through phenomena affecting both radiation and matter. We have already analyzed the pertubation in the matter distribution measured via the matter power spectrum. In the following we will study a similar quantity but related to radiation. In particular we will see the evolution of photon perturbations that leads to predictions concerning the anisotropy spectrum measured today. The photon perturbations have an evolution that can be split in two phases. Before recombination the photons were tightly coupled to electrons and protons, hence all together they formed a sigle fluid, “baryon-photon fluid”. After ricombination photons decoupled from baryons and hence free-streamed from the surface of last-scattering to us today. As clearly shown in Figure 8.1 of S. Dodelson’s book, different modes of the combination Θ0+Ψ evolve in different way. Note that the presence in the previous combination of the gravitational potential Ψ is related to the fact that photons, that we see today, had to travel out of the potential in which they were at the time of recombination. From the Figure one sees that super-horizon modes exibit a very little evolution since no casual processes can be involved. This means that large scale anisotropies, sensitive to modes whose wavelengths were larger than horizon at recombination, give information about perturbation at very early times. A different behaviour is shown by modes whose wavelength is corresponding to the so-called “first peak”. By definition they have an increasing amplitude till recombination, hence they will give the maximum contribution to the anisotropy spectrum. Then one can consider the other modes that peaking earlier reach at the recombination different values. As a function of k, their sum produces an oscillating behaviour of the total spectrum. If the recombination occurs long after the equality epoch one can take the previous expression for large y, namely Φ→9 Φp/10. This implies that at recombination . Since the observed anisotropy is Θ0+Ψ ≈Θ0-Φ we get (*) By using the equation for the matter density, namely , and the initial condition δ = 3/2 Φ we get . Note that the l.h.s. of previous equation provides δT/T, whereas the r.h.s. δρ/ρ. Neglecting terms order 1, we see that . Note that in absence of recombination kD scales as Ωb1/2. Of course such description of damping is a good approximation far from recombination. As η approaches η* one has to consider the amount of electrons swept up into neutral hydrogen. The dependence of on μ does not allow to write immediately the expression for Θl. that allows to interprete it as a probability density. In particular it is the probability that a photon last scattered at η and results to be peaked around the recombination epoch η*. The term proportional to e-τ gives conribution after recombination but are different from zero only in case of variable gravitational potentials. In many theories such potentials become constant after recombination so this term tends to vanish and in any case do not modify the qualitative behaviour of the solution. Hence, the dominant terms result the ones proportional to g(η). In the previous equation one has used the fact that at η*.Such equation essentially states that the anisotropies today are determined by the monopole (Θ0), the dipole (Θ1), and the potential (Ψ) at recombination. The additional effects related to the time dependence of potentials, also known as “integrated Sachs-Wolfe effect“, are contained in the integral term of previous expression. It is interesting to note that since , the Bessel function is very small for x < l.
This implies that Θl(k, η0) is almost vanishing for l > k η0. We can summarize the previous results by stating that a perturbation with wavenumber k mainly contributes on angular scales of the order of l ≈ k η0. The small scale anisotropy spectrum is more involved since it depends not only on the monopole, but on the dipole and the integrated Sachs-Wolfe effect as well. Such parameters show an high level of degeneracy, which can be removed by considering a wide range of cosmological observables. In figure we show the anisotropy spectrum as presently measured. 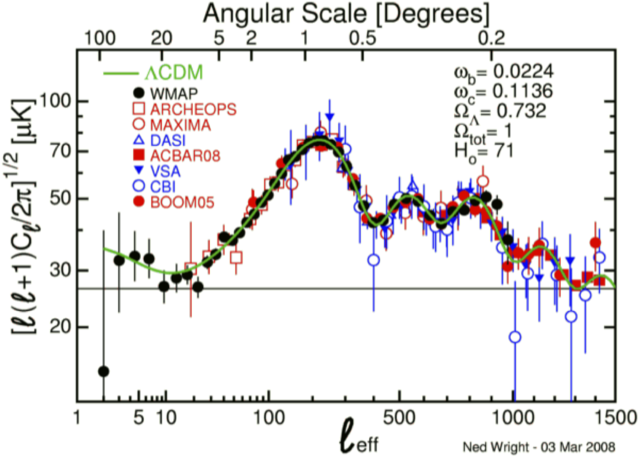 CMB data after 5 years of WMAP, improved ground-based and balloon-borne experiments. ΛCDM fairly agrees with the data.